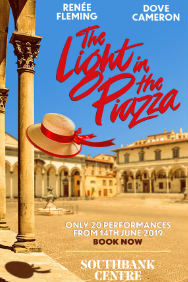 The Light in the Piazza tickets at Southbank Centre, London. 2019. Performers Renee Fleming (Margaret Johnson), Dove Cameron (Clara Johnson), Rob Houchen (Fabrizio Naccarelli), Marie McLaughlin (Signora Naccarelli), Malcolm Sinclair (Franca Naccarelli), Alex Jennings (Signor Naccarelli), Liam Tamne (Guiseppe Naccarelli), Celinde Schoenmaker (Franca Naccarelli), Simbi Akande (Ensemble), Danny Becker (Ensemble), Nicholas Duncan (Ensemble), Chloe Hart (Ensemble), Molly Lynch (Ensemble), Rhona McGregor (Ensemble), Tom Partridge (Ensemble), Monica Swayne (Ensemble), Matthew Woodyatt (Ensemble). Book by Craig Lucas. Music Adam Guettel. Lyrics Adam Guettel. Director Daniel Evans. Design Rob Jones. Costume Brigitte Reiffenstuel. Lighting Mark Henderson. Company Orchestra of Opera North. Conductor Kimberley Grigsby. Friday, 14th June 2019 to Friday, 5th July 2019. Terms: Valid on all performances from 14 Jun-5 Jul 2019. Book by 5 May.. The Light in the Piazza tickets: The tabs above allow you to select between links to suppliers and date searching. Click on a supplier's logo to see their details and on the 'buy now' button to see and check the tickets on offer.